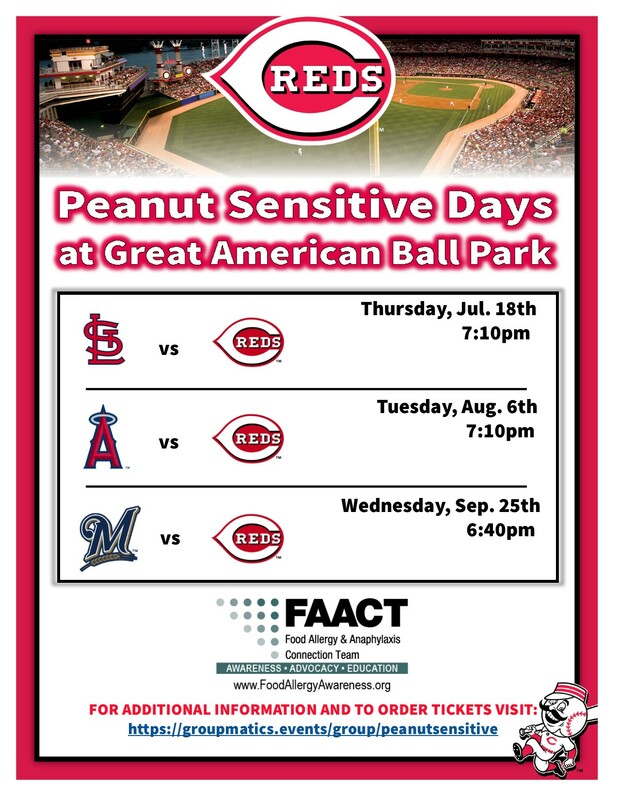 FAACT has partnered with Cincinnati Reds to offer three peanut-sensitive games this year. Seating will be in the Cincinnati Bell Technology Pavilion in center field. This is a private indoor seating area away from concession stands or regular ballpark seating. All three games will be held in the private, enclosed, and newly renovated nut-free suite. There are 100 tickets per game at $30 each, with $4 from each ticket being donated back to FAACT. The area will be cleaned thoroughly prior to the game including wiping down and sanitizing all hard surfaces, baseboards and furniture and detailed cleaning of the private restrooms. Additional event and janitorial staff will be on hand as well as a medic. Only those with ‪‎food allergies, their families and friends will be permitted to purchase tickets through this special offer. Nut-based products from the ballpark stands will not be permitted to be brought into the area. They encourage those with ‪food allergies to bring in food from home. (No glass bottles, cans or hard-sided coolers).